Mitch McConnell helped Don Blankenship’s company avoid dire regulatory consequences for a disastrous spill in 2000. 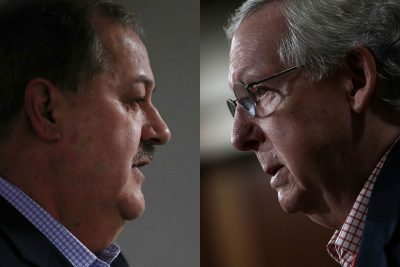 As the race for the West Virginia Republican Senate nomination hurtles toward Tuesday’s primary, candidate Don Blankenship, the former coal executive sentenced to a year in federal prison in connection with a 2010 mine explosion that killed 29 men, has unleashed blistering invective against Senate Majority Leader Mitch McConnell and his wife, Transportation Secretary Elaine Chao. The spill, which was vastly larger in scale than the oil spill from the Exxon Valdez, left a 70-mile path of destruction running all the way to the Ohio River, killing 1.6 million fish and countless wildlife that got stuck in the muck or drank from it, sweeping away roads and bridges, and contaminating the water systems of more than 27,000 people. Major consequences loomed for the owner of the Martin County Coal Company: mining giant Massey Energy, which was led by Blankenship. Among the agencies that kicked into gear were the Mine Safety and Health Administration, which had issued recommendations about strengthening the holding pond walls in 1994 following a smaller spill. A team of investigators from MSHA was on its way to alleging eight separate violations against Massey that could have resulted in hundreds of thousands of dollars of fines and laid the legal basis for criminal charges of willful negligence. But in the midst of their work, the presidency fell to George W. Bush following the Florida recount and Supreme Court ruling in Bush v. Gore. “I don’t think I have ever felt better, including my own election victories, than the night of the Supreme Court decision,” McConnell said later. MSHA, which is part of the Labor Department, was overseen by the secretary of labor: Chao, whom Bush nominated upon taking office. Chao, who had previously led the Peace Corps and United Way, turned to her husband’s associates to fill out her office. She hired as her chief of staff Steven Law, who had served six years as McConnell’s chief of staff (and went on to co-found the super PAC Crossroads GPS with Karl Rove.) She hired as her spokesman McConnell’s former spokesman. And the new director for MSHA, a former Utah coal operator named David Lauriski, hired as one of his top aides yet another former McConnell staffer, Andrew Rajec, who began attending many of the meetings of the Martin County investigators. Thompson pushed to have the case against Massey reduced to just two violations with a fine of $55,000 each, rather than the eight that Spadaro and his fellow investigators believed were justified. One day in April 2002, Thompson got a call from MSHA headquarters outside Washington, D.C., after which, with the investigators watching, he crossed out a section of the draft report that called MSHA to account for its lax oversight. Soon afterward, Spadaro became the target of an internal audit. When he was called to MSHA headquarters outside Washington, D.C., to be reprimanded, MSHA officials went into his office in West Virginia to confiscate his files and hard drive. They picked apart his family photos to search for incriminating evidence he might have tucked inside the frames. A few months later, he was fired. He challenged his termination and had it reduced to administrative leave, but when the agency then demoted him and ordered him to a post in Pittsburgh, he quit. Meanwhile, the investigation sputtered to a close. In April 2002, MSHA cited Martin County Coal with just the two violations — and its case for those was so halfhearted that one was later dismissed by an administrative law judge and the other reduced to a mere $5,600 fine. What was particularly striking about the light approach taken by Chao’s Labor Department was that it would have been easy for the Bush administration to use the disaster as a political weapon against its predecessors — to blame the disaster on the lax oversight by Bill Clinton’s MSHA. Taking a stronger stand on the spill would’ve been a way to stand up on behalf of the people of eastern Kentucky — her husband’s constituents. But that also would’ve meant coming down hard on an industry that had, by 2000, swung firmly behind the Republican Party and McConnell in particular. Over McConnell’s career, his fifth-biggest source of campaign contributions was Peabody Energy, the largest coal company in the world. Between 1997 and 2000, when he led the National Republican Senatorial Committee, the coal industry gave $584,000 to the group, making it one of the group’s staunchest supporters. And Massey? It hadn’t given the NRSC anything. That is, not until 2002, when the investigation was still pending. That year, it cut a $100,000 check to the group. Fast forward to 2018. Massey Energy no longer exists, having been subsumed by Alpha Natural Resources. West Virginia has become a stronghold of Trump country, not least because of his outspoken support for the coal industry — he won the state by a whopping 42 percentage points. Blankenship is seeking with his campaign to tap into the same iconoclastic fervor that drove Trump. But McConnell calculates that even in West Virginia, the party’s best odds for knocking off Democratic Sen. Joe Manchin in November do not lie with someone who not long ago was behind bars in connection with the deaths of 29 West Virginians — and whose primary residence is a $2.4 million villa with palm trees and an infinity pool near Las Vegas.